Most readers of this blog will be aware that we don't much like corporation tax. In various blogs, articles and reports we've called for its abolition and replacement. We've argued that it falls heavily on workers, discourages investment and encourages excessive accumulations of debt. But I think it's worth getting into the fundamentals of why we think corporation tax is so harmful and what you'd need to do to fix that. Simply put, corporation tax taxes capital (goods that produce other goods, from new machinery to training and professional development) and taxing capital deters firms from investing in their workforce, lowering productivity and wages. People invest money today in order to spend it at a later date. 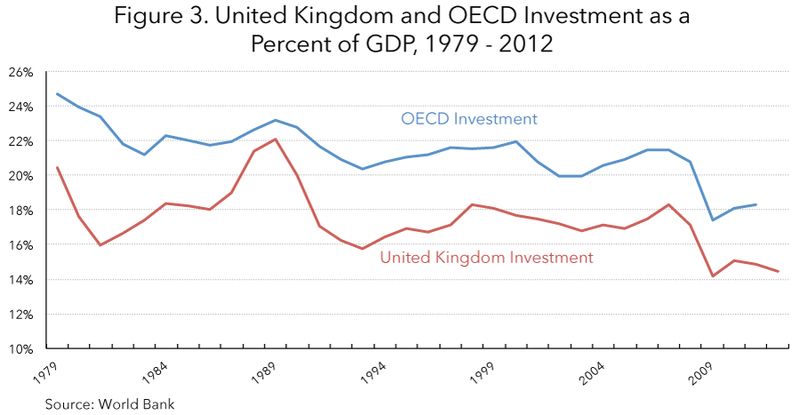 By taxing investment you essentially are imposing an uneven tax on consumption. You're taxing people who invest and wait to spend their money at a higher rate than people who spend it immediately. And it gets worse: the longer you wait to spend your money the higher the consumption tax rate will be when you do. In fact, relatively low tax rates on investment can imply extremely high rates on consumption down the line. I wrote a blog a few months back explaining the maths behind that. But while there's a lot wrong with corporation tax, fixing it is actually quite simple. Let's think about this from the point of view of a business. Pretend you own a widget factory and you're deciding on whether or not to invest in a new Widgetmatic 3000 widget-making machine. You'll only make a marginal investment if the return you get from it outweighs the cost of investing. But suppose you could deduct half the value of the investment from your taxable income. That'd lower the cost of capital to 12.5%. The bigger the deduction, the smaller the effect the headline tax rate has on the cost of capital. If it's a full deduction, then the tax rate is irrelevant. If you want a more mathematical proof, check out Alan Cole's Tax Foundation report on it. As it stands businesses can gradually deduct the cost of an investment from their tax bill over the years as it depreciates. But unlike normal business costs like purchasing pens and papers, the purchase of a new widget-machine wouldn't necessarily be deducted in full the year it was bought. Herein lies the problem – things are worth more now than they are tomorrow. It's simply better to have £50 today than £10 every year for five years. That's because you can put that £50 in the bank and collect interest. You've also got to deal with the value of that £50 being eroded by inflation. If you let people deduct the full cost of an investment just like any other business cost, then the tax rate doesn't matter. Corporation tax would become what we call a cash-flow tax, a much simpler way of raising revenue. It would effectively tax consumption and profits above the normal rate of return (what economists call rents). Instead of complicated corporation rates where businesses have to hire accountants to manage a range of investment allowances and depreciation schedules, a business would only be taxed on its annual turnover minus its investments and normal business costs. Moving to such a system would be rocket-fuel for investment, boosting GDP and wages. When Estonia replaced their corporate income tax with a cash-flow tax levied on shareholders they attracted significantly more investment than neighbouring countries. This is the idea at the heart of a lot of free-market plans to abolish corporation tax, with both the IEA's Diego Zualaga's and the TPA's Single Income Tax plans featuring Estonian-style dividend taxes. Many economists have argued the theoretical case for increasing and speeding up depreciation deductions, but it's been hard to prove empirically because we can't usually isolate the effect on investment from other bigger macroeconomic changes. However, a new paper from the Oxford Centre for Business Taxation backs up the intuition that it's the deductibility of an investment that really matters with proper empirical evidence. On the EU's recommendation in 2004, the Labour government changed the definition of SME, allowing many more companies to qualify for First Year Allowances (FYAs). FYAs let you immediately deduct the full cost of an investment up to a certain amount (rather than deducting it as it depreciates). Devereux and colleagues compared those firms that now qualified for these deductions with firms that never qualified throughout the process. They found that investment rates increased 11% relative to firms that didn't qualify. Over the past few years, the government has been focused on lowering the corporate tax rate. This is broadly speaking a good thing: the corporation tax as it stands deters investment and a lower rate will deter it less. But as The Tax Foundation's Kyle Pomerleau points out there's been a big problem. As they've cut the headline rate, they've also lengthened depreciation schedules. Think back to the widget example, they may have the main rate but they've also cut the deduction to make up the revenue. That's a problem. Pomerleau points out that even though the corporate income tax rate has declined in the United Kingdom, the effective marginal tax rate on corporate investment has actually increased. We actually have a higher effective marginal tax rate on corporate investment than the US (the third highest in the OECD). In tax terms, the cost of buying a new Widgetmatic 3000 is higher now. That explains why despite having one of the lowest corporate tax rates in the OECD, Britain persistently invests significantly less than the OECD average. It might even go some of the way to explaining why Britain's consistently lags behind our friends in Europe and America. Devereux's findings shed light on the solution. Let's switch to a cash-flow tax to boost investment and give British workers a well-needed pay-rise.